Hello there, I’m Ian from In the Booth Toowoomba! The opportunity to give a first class experience to the Darling Downs area (an area I have lived in for most of my life) through In the Booth is something I truly value. It never ceases to amaze me the attraction of a photo booth. I love watching people experience the photo booth for the first time and then come back again and again – once is never enough! It’s great being a part of something that brings so much enjoyment to an event and has timeless appeal to all age groups – the booth seems to possess its own magnetic attraction! I never tire of hearing those words “what a great idea”! When we’re not boothing it up I’m often out running and love hanging out with our two awesome and very busy boys Charlie and Sam. 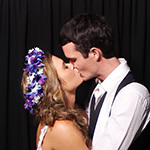 If you’re planning a special event and looking for a Toowoomba photo booth hire service, we’d love to hear from you! "It was our pleasure having you! Thank you so much for supporting us for the evening. 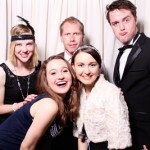 Everyone who attended said that the photobooth was one of the highlights of the evening! We received our digital portfolio in the mail yesterday. I was astounded by the beautiful box that I pulled out of the postal bag and kept being surprised when I opened it up! Thank you for the links and the fantastic reel of photos from the night! The link has already been well used. Once again thank for providing a fantastic service and for having a wonderful business. 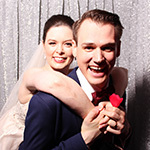 All of us involved will be more than delighted to be able to recommend you to anyone looking for a photobooth in the future." "Thank you so much for the use of the booth at our wedding. We had a fantastic day and all our guests really enjoyed using the booth. We love looking back on the photos and are so impressed with the quality. It was great to get two copies of the photos so our guests could remember the night as well. Your supervisor was very polite and patient with everyone. The booth really made our night enjoyable! Thanks again." "Thank you so much! We had a fabulous time. The booth was a complete hit at the Christmas Party!! Photos are amazing quality and the attendant for the night and Luke was so helpful!! We will definitely recommend your company and will use you guys again. Thank you once again - Merry Christmas and all the best in the new year." "It's really the least I can do to tell people about 'In The Booth' Toowoomba. I hope people have booked you because of it. I truly do think it made the night as I knew most of our guests were not dancers. I didn't want a guestbook with just a list of names that would be shoved on a bottom shelf somewhere. People still ask about my guestbook and the ridiculous, slightly inappropriate but hilarious photos they took! My Mum and I first saw your booth almost two years before my wedding at an expo. I just loved the book and Mum just decided that was it - and thankfully you let us book without a set venue or time. You were the first thing we organised and the smoothest. If I ever need a photo booth again I'll be sure to call (although it won't be for a wedding I'm the bride in again - that's a successful one off event). Thank you for taking the extra Guest Cam photos for me. They all great, but the ones of Dad and I are special. " "Hi Ian, nearly two weeks have passed since our wedding so we thought we'd drop you a line to say thank you for the wonderful service you provided us with on the night! The booth was well used over the evening and Alice was a fantastic host! She even tracked us down late in the evening when she knew we hadn't visited yet! Our guest book has to be the highlight, looking through all the images and messages was just wonderful and is such a nice reminder of our wedding reception. Ian, thank you for sending through the pictures of the booth all set up on the day. Although I didn't reply, I did see them while I was at the hairdresser and it was lovely to see it all coming together before I got there. Thank you for your professionalism and being so easy to deal with, from our first contact, to our payment plan and set up everything has been a breeze. We will have no hesitation in recommending you to anyone who asks! Thank you once again for adding this very special element to our wedding reception!" "Ian, I would just like to say thank you! Thank you for the hire of in the booth - the guests had a wonderful time using it and I can't wait to see all the photos and video messages that were taken! Please give a massive thank you to Brittany. She did a wonderful job being our attendant! She did so well putting up with all of us and she was such a nice, awesome girl! So please make sure you tell her how much we appreciate her being apart of our day!" "Hi Ian, just a quick email to thank you so much for being such a great part of our day at Gabbinbar. Ian, thank you so much for your professionalism and encouragement to use the booth! All our guests agreed it was one of the best photo booths they'd experienced which is such a great credit to you. The little touches that definitely went above and beyond for Stu and I definitely did not go unnoticed and something we are so thankful for. We are both so excited to have those photos and the album to look back on. Thank you so much once again!" "Hi Ian, on behalf of the Dalby Chamber of Commerce, I'd like to thank-you for the photo booth. As always, In the Booth contributed to the success of the night and we loved having you join us. We can't thank-you enough for your support towards this event." 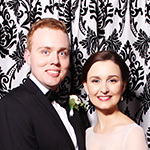 "In the Booth Toowoomba was an excellent addition to our wedding at Gabbinbar Homestead. They were easy to communicate with throughout the whole process, the photos were of great quality and our photo booth attendant, Ian went above and beyond to get guests interested, give ideas on getting good pictures and encouraging guests to put pictures in the guest book. I had a great experience with In the Booth for a university graduation ball previously and was very glad we booked them again for our wedding!" 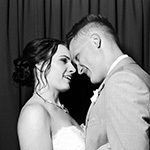 "Thank you all for making Andy and Ellie's Wedding a most memorable and special day. Everyone loved the photo booth and had such fun. It certainly brought us all together and then some. Amanda, you were amazing getting us all to participate and make it a wonderful experience. Right from the start when the fantabulous Ian called me about my tentative but frantic enquiry through to Nicole's promptness and efficient manner and then to the beautiful Amanda whose smile never left her and how she waved her creative wand in making their guest book sooo beautiful. We all very much appreciate all your efforts in making Andy and Ellie's wedding day the best day ever. Wishing you all continued success and happiness. On behalf of us all, the sincerest of thank you's." 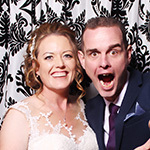 What is it you love about providing Toowoomba photo booth hire services? Watching guests enter the photo booth for the first time, hearing the laughter and then gathering around to look at their prints – to us, that captures the photo booth experience. It's the best. We attend weddings, birthdays, and all manner of corporate events so they are always fun and happy events (we are lucky!). Toowoomba plays host to some amazing events such as the 2014 Care Flight Gala Ball at the Empire Theatre Toowoomba. 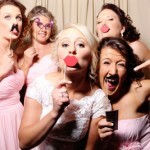 There are so many highlights for our Toowoomba photo booth hire business! 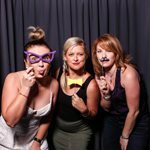 Tell us about some uniquely Toowoomba touches you have seen at an event? Toowoomba is simply beautiful but we remember when Tammie and Damian had the Haviana thongs out for the ladies to change into when they when they were dancing at a Picnic Point wedding, that stands out for sure. We’ll also never forget the 1950’s themed belated wedding reception for Bec & Josh at Ortem Café, it was the coolest party ever with all the trimmings, and we received the cutest little music box as a gift. How many people can we fit in our photo booth – our official standard line is 6-8 comfortably, but who likes standard things? 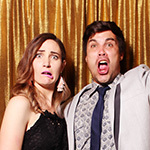 We can fit more in our photo booths, which always equals awesome and hilarious photos! First timers are always saying….’ooooh it is big’! Music, great music is a must! It just sets the atmosphere and people are relaxed and your wedding, party, formal or any event for that matter will be simply remembered. 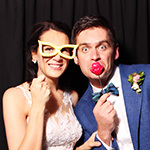 Naturally we think a photo booth is a must when having any sort of event, everyone loves them. You must come to the Carnival of Flowers, check out the street art, which was a part of the ‘First Coat’ festival. There are plenty of places to visit and see. If you’re looking for venue options make sure you check out Gabbinbar Homestead, Preston Manor, Preston Peak Winery, Picnic Point, Blank Space, Empire Theatre and Jimbour House, just to name a few.